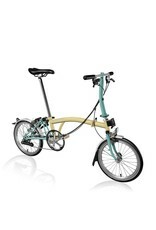 Brompton S6L Ivory / Turkish Green - J.C. Lind Bike Co.
Free shipping for Brompton bikes. 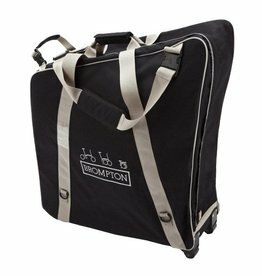 At checkout, select "Free Brompton Shipping." Brompton folding bikes are made in London and renowned for folding within 20 seconds into a shape roughly 24" x 24" x 12", all while providing a ride that is as comfortable as you'd expect from a normal (non-folding) bike. The number of potential advantages this packable bike can grant is staggering. If you're concerned about bike theft and also live in a small apartment, it's a bike you can easily bring and store inside with you (and carry up the stairs if need be!). If you have a lengthy commute which is a tangled mess of transfers from bus to train to bus, riding the Brompton can cut down on complexity, allowing you to ride part of the way and stow the folded bike easily on a train or bus. If you travel around the country or world regularly but miss having your bike to explore new places, it's the ideal bike to transport as a checked piece of luggage. If you live in a place where weather changes and you dislike riding in inclement weather, the Brompton lets you ride when it's nice and easily take the bike home with you in a carpool with a friend or coworker, a taxi, a bus, or a train. The list goes on, but you get the idea. The Brompton is nearly infinitely versatile. One way in which Brompton ensures a bike with wheels so small is still able to keep up with a typical city bicycle is through the large front chainring. This changes the gearing so that one needn't have to pedal so fast. A unique advantage of the small wheels is quicker acceleration from a stop--which in city stop-and-go traffic comes in handy. This model is a two-tone color--Ivory and Turkish Green. It has 6 speeds, achieved via a Sturmey-Archer 3 speed hub and a proprietary Brompton 2-speed derailleur. 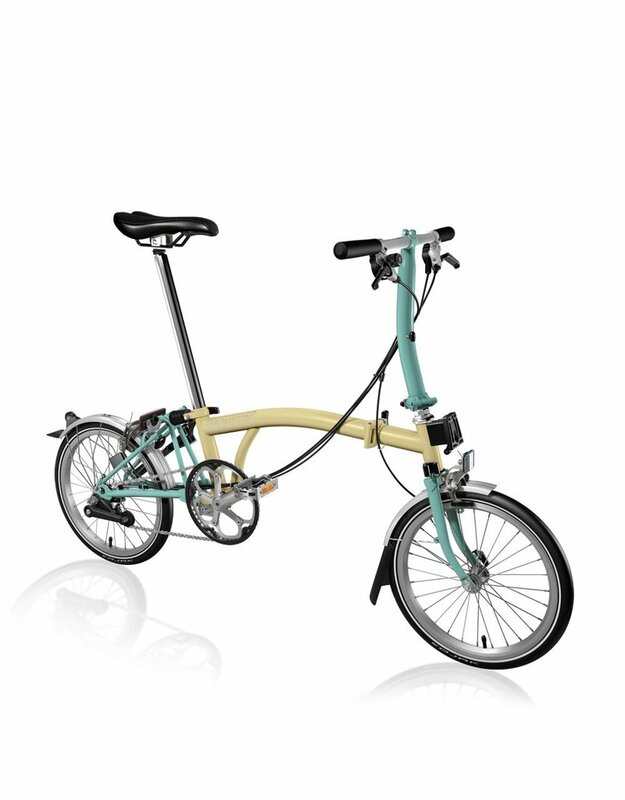 Brompton has 4 handlebar options: the S-type (a straight bar), the M-type (a medium-rise bar), the H-type (the bar with the highest amount of rise--recommended for taller riders), and the P-type (a touring style bar with multiple hand positions). This model has the S-type straight handlebar. Two flat-bar style brake levers control a pair of road style caliper rim brakes. The right brake lever has an attached bell. As with most of the bikes we sell, this model comes with fenders. Its tires are a pair of Schwalbe Kojaks, a lightweight, slick-treaded tire that still includes Schwalbe's RaceGuard puncture-protection belt. 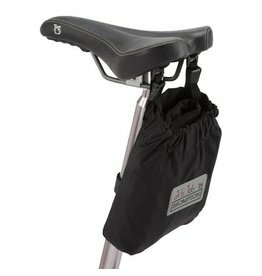 The saddle included is Brompton's standard black saddle. This bike includes the luggage block, which, attached to the front of the frame, allows you to mount any of Brompton's front-mounting bags. 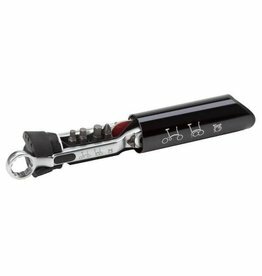 This toolkit hides neatly inside the main tube of a Brompton and has all the essentials for repairing a punctured tube, making any small adjustments, or tightening any lose bolts. 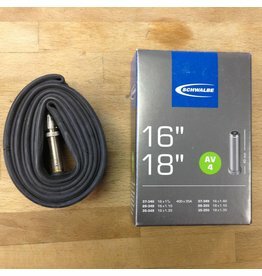 This is a 16x1.1-1.4" tube, used most commonly (at our shop) on our Brompton folding bikes. It's a small bag to store your keys & phone; it's a big bag to cover your Brompton! 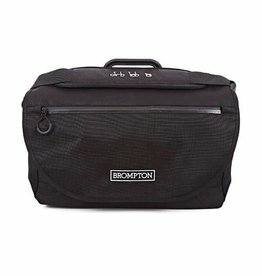 The S-Bag is a smaller front bag from Brompton which can be used with the S-type handlebar and all other handlebar types. This one is Black. 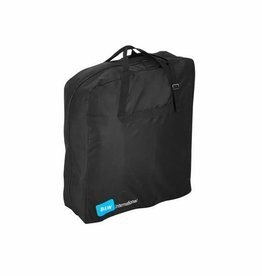 Use this bag to check your Brompton at the airport and travel with your bike. 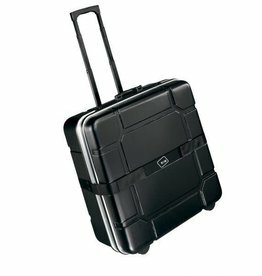 A rolling piece of luggage with a hard shell that carries your Brompton through the airport and while flying. A bag to discreetly carry your Brompton.